I am looking for the best variety/ies of grape to grow. Dual purpose-grapes and leaf. I wish to make dolmades so the leaf needs to be not deeply lobed as, if you are familiar with dolmades, uncooked rice is rolled in the leaves, making a cigar shape....cut leaf grape varieties would make this very difficult. I am assuming that all grape varieties have edible leaves... my research would suggest this. Do we have, in Australia, any of what are referred to as American wild grapes. Well, when you throw open an invitation you never know what to expect. I love it when people come up with questions from left field and I don't really know the answer. I have made dolmades from home grown vine leaves in the past, many years ago. I think the vine was a gordo muscat. As you say having a vine with a deeply lobed vine does make the process a little tricker. Cabernet Sauvignon, for example, has deeply dissected leaves; Chardonnay has entire leaves and would be very good. white? Table grapes or wine grapes? If you live in Southern Victoria you need to have an early ripening variety to get any fruit. As to part two of your question I think you are referring to hybrid grapes. Most varieties of grapes that we have in Australia are of the species Vitis vinifera, native to the Mediterranean region and Europe. American grapes are of several other species in the Vitis genus, for example V. labrusca, V. riparia, V. aestivalis, and V rupestris. 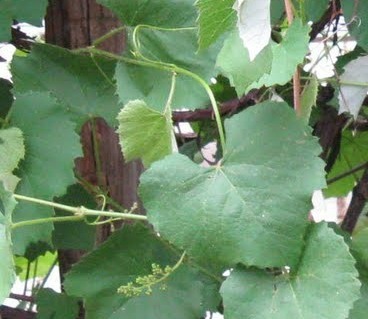 There are many hybrids between Vitis vinifera varieties and the American species. They are actually called French Hybrids. One of the most common hybrids in Victoria is Isabella, derived as cross of V. lambrusca and V. vinifera. It is not widely grown commercially, but is present in may backyards. Italians, here and in Italy like it because it makes sweetish wine with a flavour like strawberries, hence its common synonym Fragola, derived from the Italian word for strawberries. The vines are vigorous and disease resistant. The leaves are large and fleshy so I think they probably would be OK for dolmades. Ask around among any Italian friends you have. They will know someone who knows someone growing an Isabella vine. Two Degrees of Separation will be enough I think. Grow a vine or two from cuttings. Further comments from other readers welcome.